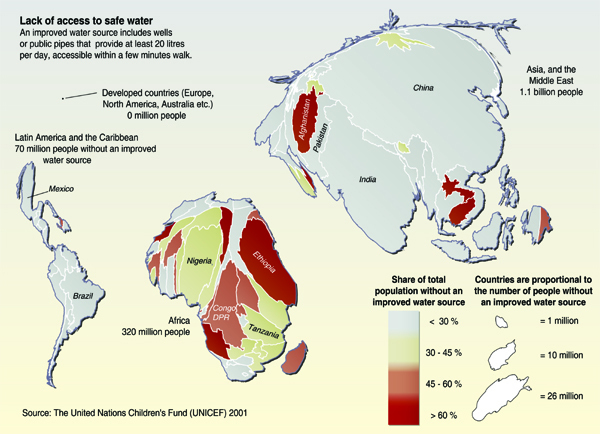 In some regions of the world, water scarcity has already become an acute problem. The situation will deteriorate dramatically in the decades to come if we continue to overuse, waste and contaminate the resources available at local and regional levels. The IAASTD warns against bitter disputes within societies, but also between states, right up to violent conflicts and wars over water. Agriculture could reduce water problems by avoiding the cultivation of water-intensive crops such as maize and cotton in areas which are too dry for them, as well as by improving inefficient cultivation and irrigation systems that also cause soil salinisation. Other practices that could be avoided include the clearance of water-storing forests, evaporation over land left lying fallow and the (in some parts of the world) dramatic overuse of groundwater sources. The IAASTD recommends irrigating agricultural areas more efficiently than today and intensifying the “water harvesting” of precipitation. The report describes easy methods to avoid water evaporation directly from the soil, to increase the water storage capacity of soil and vegetation, and to build local water reservoirs and irrigation systems. According to the IAASTD, in the world’s most vulnerable regions there is hardly any other measure as effective for the stabilisation of the hydrological cycle as the conservation and expansion of forests and trees. Decisive for the sustainable use of our water resources are water management systems which take all users of a watershed into account and provide them with the necessary rights and duties to maintain this common property. 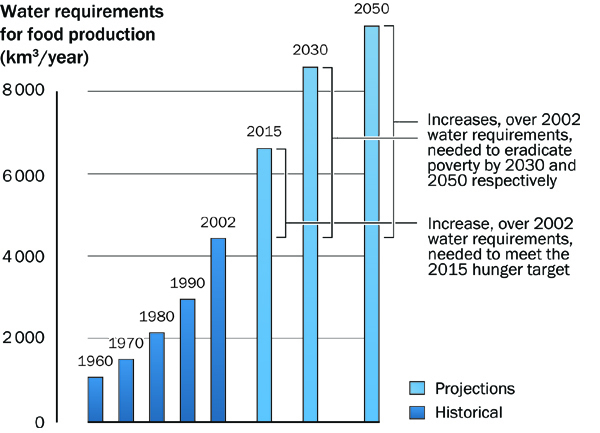 The IAASTD does not rule out that the water-scarce regions of Africa and Central Asia will have to import food products from regions with abundant water resources in the future. Today, this export of “virtual water” already takes place on a large scale, although in the opposite direction. Water embedded in cash crops is imported from developing countries, flowing mainly as animal feed into the meat production systems of industrialised countries. Spot: Why is water so important to our food security?